These five Information Points offer help and advice about facilities and their locations on and off-site. They give travel information and you can take found property there, and take your mail for daily posting. They also have phone numbers for cancelling lost bank cards and they have a landline for emergency calls. 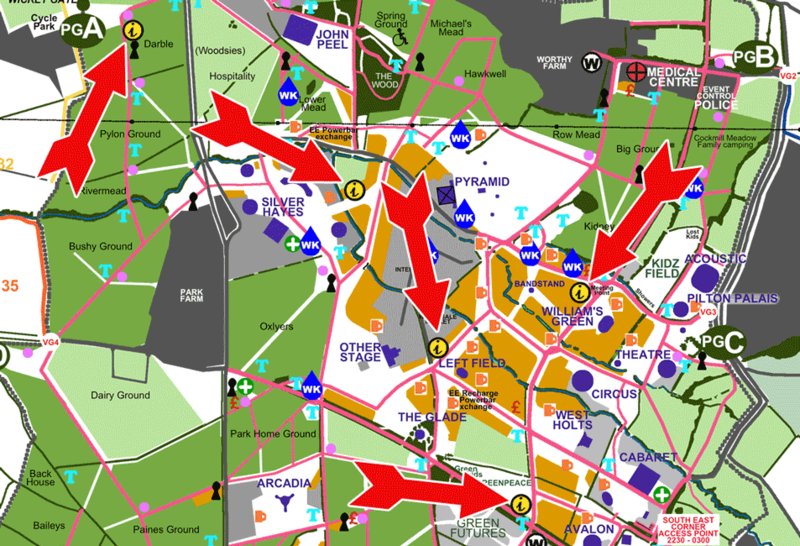 As well as free stuff including detailed site maps, bin bags, ear plugs, sunscreen, condoms, Guardian Guides, and The Glastonbury Free Press (when available) they also sell copies of the official Glastonbury Festival programme. The Info team will also be offering a Twitter service again at this year’s Festival, with questions sent by Festival goers to @glastoinfo answered by their team of Info tweeters from Tuesday afternoon through to Monday afternoon. Main Info at the Meeting point is open 24 hours from Wednesday 8am through to 5pm Monday, and the 4 other other Info points are open 8am til late. There is also a Travel Enquiries Cabin outside PGA and an Info point at Worthy View for people camping there.